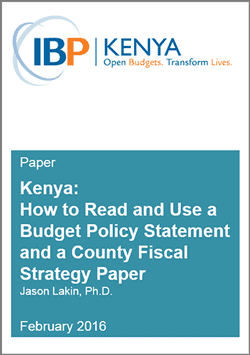 February 2016 | by Jason Lakin, Ph.D.
Part of a series on how to read and use Kenya’s key national and county budget documents, this guide examines the Budget Policy Statement (BPS), a document which must be produced by the national government every year, using Kenya’s 2016 National BPS as an example. At the county level, the equivalent document is called the County Fiscal Strategy Paper (CFSP). The principles outlined in this guide can also be applied to reading a CFSP. The guide is meant to be read alongside Kenya’s 2016 National Budget Policy Statement (BPS), available for download here. The BPS is tabled in the national assembly no later than February 15 and should be made available to the public within 15 days of being tabled.